The term “grass fed meat” sounds self explanatory and you may think that all cows eat grass right? Well at one time they did and the question of what is grass fed meat was like asking what is a cell phone today. The “grass fed” term hasn’t been used much until the past few years with more awareness of the problems of our industrial food system and the concern over humane animal welfare. As these issues become more widely know many are asking if grass fed beef is the answer to our meat dilemma so I will give you some information to chew on (pun intended) about what grass fed beef is and is not. The first thing to understand is that there are primarily two kinds of beef animals being raised for meat today. It really has nothing to do with the breed of the cow or color. before they start weaning off of milk and they eat grass either on pasture or fed hay during dormant grass seasons like drought or winter. Beef cows in a feedlot. with some grass. The grass they do get is usually harvested from fields by machinery then stored and brought to the cows as they need it. 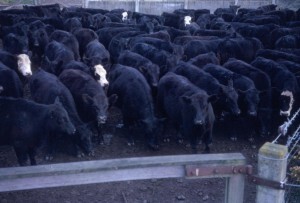 This group is often raised in large quantities in contained areas called feedlots. The farms are referred to as CAFO which stands for confined animal feeding operations. This type of farming is geared for high efficiency of moving materials in large quantities and fresh forage is usually minimal or nonexistent. To understand the importance and value of grass fed beef we need to look at the way a cow was designed to function. A cow is perfectly designed to eat and digest fresh grass. They are a four stomached herbivore with the capacity to turn chlorophyll and fiber into meat and energy. You and I can’t eat grass and get the nutrients from it that a cow can. Quite simply they are a four legged mowing machine with four digestive fermentation pots that can turn grass into food for us like nothing else on earth and they enjoy doing it. I would like to paint a brief word picture for you. Joel Salatin came up with the phrase “salad bar beef” and it is a good description of how beef should be. imagine you are eating someplace that is serving you buffet style and you step up to the buffet and you admire the many selections of food prepared and set out. Envision all the wonderful pasta dishes and the many varieties of breads. Beautiful fruits and vegetables. You may see several options of meat like fish, pork, chicken, roast beef. How about the many arrays of soups and all the salad toppings. You may find dishes from all kinds of ethnic backgrounds like Chinese, German, French, Mexican, Italian and others from around the world. Perhaps a whole section just for desserts. Are you liking it? Getting hungry? Your biggest problem is knowing where to start and what to choose. It would be nearly impossible to come away from a spread like that and not be filled and content. Now think about it from a cow’s perspective. Nothing is more appetizing to a cow than walking into a fresh pasture with a huge assortment of vegetation. It is like a salad bar for cows. All the different plants on the buffet have different nutrients and minerals so the cows get everything they need. They dine on the numerous fresh plants and are soon filled and satisfied. They lay down and ruminate their harvest and enjoy life to the fullest. This is grass fed to the max at its finest. Can you see why a cow would delight in a life like this? Can you see why a cow would be healthy and vibrant in this kind of environment. So would you rather have the buffet I mentioned above or would you rather have three week old leftovers that have been frozen, refrigerated, heated, and reheated to the point where it doesn’t even look like the original food anymore and taste stale and bland. That is what it is like for a cow in a feedlot being fed stored feed and grain that has been processed so many times that you can’t tell the original form of the grass or grain and most of the nutrient content has been lost. Now granted it is not practical or possible to keep a cow in this heavenly environment at all times with dynamics like weather, hot and cold seasons, rainfall shortages and such but if we can maintain a prime environment as much as possible the benefits are substantial. In fact I have found that the more I try to use the best growing conditions the less the negative factors of weather play in. As I raise grass fed beef animals each year I experience more and more of the wonderful benefits. I will just give you a quick overview of what that can be. Nutrition – Grass fed beef has been found in multiple analysis to have much higher minerals and vitamins than conventional grain fed beef. It has a better balance of Omega 3 and 6 fats. It has more conjugated linoleic acid (CLA). We are what we eat so if the cow is gazing on nutrient rich grass you can expect it to have more nutritious meat. Environmentally friendly – This is a huge subject but the short of it is that the cows live in a visually and aromatically attractive environment. We should use our God given senses to check if something is good or not. If it looks, smells, tastes, and feels bad then we need to take caution that something is out of balance. 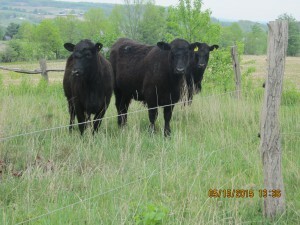 Animal safety/health – Totally grass fed beef cows don’t have many of the health problems of grain fed cattle. There is little need for medications like antibiotics and vaccines. The issue with parasites is minimal since the cows are continually rotated onto fresh pastures. They get plenty of exercise and sunshine. They are less likely to be injured by crowded facilities. Economical – The cost associated with grain fed beef cows is substantial considering what it takes to till the ground, buy and plant seeds (can’t replant GMO seeds), spray with pesticides/herbicides, harvest, process, store, and transport the grain. We raise beef animals with very little expense because we don’t’ need the huge material handling equipment and buildings. About 60-70% of the corn and soy grown in the US is fed to cows that would do better if they were eating grass. If the US could turn its corn and soy fields into perennial pastures we could grow several times more beef that is superior in quality and affordable to buy. This is why it is wise to find a local farmer that you can buy from to help keep the cost down and the quality up. Sustainable – The current trend of raising beef on grain is not a sustainable model even though the industry spends millions of dollars to make people believe that their broken system is what is needed to feed seven billion plus people. There are many arguments against the industrial model but I would rather focus on what is working. I have experienced how sustainable the grass fed system is by the way our pastures look from year to year. Each year our pastures grow better and more grass than the year before and this tells me that we are doing something right. Taste – This is about impossible to put into words and all I can say is what I have experienced. I have had beef from many different sources and I actually was never very enthused about eating steaks and roasts. They always seemed tough and bland unless you season it to no end. When I discovered true 100% grass fed beef I couldn’t believe how great it was and now we eat steak regularly. It’s leaner with just the right amount of fat to keep it moist. Grass fed meat is tender and we don’t do anything to tenderize it before cooking. It is simply a pleasure to eat. Want your own grass fed meat? My hope and prayer is that one day totally grass fed meat will be available to everyone in a local and affordable manner. For now it takes some work to to find a good trusted source but there are sources. You have to look and ask questions. The main things to look for is if the cows are on fresh grass as much as possible by keeping the cows in groups and rotating them on new pasture regularly (we like to do it daily). This is often called managed grazing or rotational grazing. Unfortunately there are many companies marketing grass fed meat but are not following the best pasture management plans and the cow don’t get the best grass they can. We sell our grass fed beef and pastured chickens locally and if we can help check out our store here. If you can’t find a local farmer I have found a few good online sources that are really focused on quality grass fed meat at it’s best and you can find them on our where to buy grass fed meat page. Hope you get to experience the best that grass fed meat can be and if you have any questions or comments I would be glad to hear from you below. 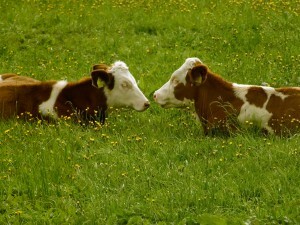 great article on grass fed meat. In this era we live in today, a lot of youngsters live without knowing what free range means and they don’t see the benefit of consuming meat of animals who are grown normally as compared to those who are force-fed just for the sake of mass production. I hope you’ll be able to educate more people with your post friend, you could give talks about this. Keep up the good work, god bless. Thanks for your comment! There is a lot of confusion on what quality nutrient dense meat is and it is due to the disconnect between the farmer/producer and consumer. What is between them is a huge corporate food conglomerate that is focused on profits and does a great job keeping the consumer in the dark about what goes into the food system. Glad you liked the article and I hope for the best for you as well. Organic milk is rich in unsaturated fats omega-3 is beneficial for the proper functioning of the heart, then meat from grass-fed beef could effect “anti-inflammatory” higher than that of cattle fed grain. French give cows wine to drink, the idea is that happy animals give the best meat. How is very costly one kilogram of beef costs 100 euros. Thanks for your interest in in this article. Looks like you have been doing your homework on what should be in healthy foods . There are many health benefits to consuming grass fed meat and many of those benifits are lost in grain fed meat and milk. Thanks for your comment and God bless! I think your article on grass fed meat is bound to raise awareness especially to younger demographics who never got the chance to taste the non-industrialised way of nutrition. And about time if I am honest! I will definitely bookmark your site and come back for more quality posts like this one. It’s great you have an interest in grass fed meat! It is sad that so many young folks don’t know what real food is. My hope is that more people become aware of how disconnected they are from their food source and start questioning how their food is grown. Our health depends on it! Thanks for your comment George! I’m all for the ethos behind grass fed meat products. I ca not say that I feel sorry for coupes up animals under the grain fed system but I genuinely feel and taste the difference of grass fed meat. It’s always interesting to hear the different results with the Paleo diet. I have found that many people do well on it. We just simply like meat so we incorporate it into most meals. There is many benifits to the grass fed and pastured meat and the results show up in great tasting meat for sure. Thanks for stopping by!